Am I Too Young To Be An Entrepreneur? According to a recent study by the Kauffman Foundation, the answer is yes. Kind of. By the way, if your aren’t familiar with the foundation, check them out NOW because they have tons of great resources for entrepreneurs, young and old alike. 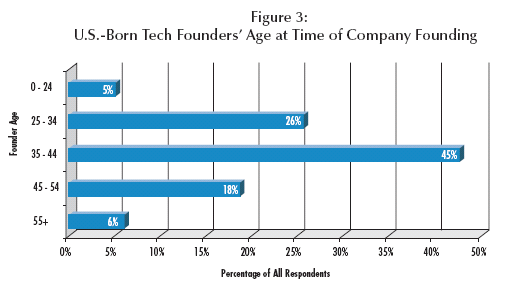 At any rate, I must admit I was quite surprised by the findings of their study on the correlation between age, education, and forming a tech startup. As you know, I focus more on the needs of student startups, but as it turns out they are the minority – even when it comes to technology based startups. What does this mean for you and your pursuit of the next great student startup? A couple things, actually. First off, the findings of this survey suggest that you (and I) are well ahead of the game. The small business experiences we are endeavoring in will only further the chances of success in the long run. Think about it this way, most people wait until they are in their late 30’s or early 40’s to take the leap into entrepreneurialism – many of whom will fail for a variety of reasons. But by starting young, you benefit from the fact that failing is virtually meaningless (financially speaking). You can then learn from your mistakes and build upon your successes and failures so that your next venture will be that much more successful. So take the study with a grain of salt and do not give up your pursuit of creating the next great startup! Class dismissed. 173, that is a fairly big number when it comes to publishing a resource list. But starting and running a small business is no small task I remind you, hence the need for such an encompassing collection of linkage. While it may appear daunting, I assure you that there are some really great resources tucked inside of this article, and I hope at least one of them gives you the inspiration you need to get your startup rolling or achieve the next level in operating your business. The list includes many resources that are beyond a simple Google search and contains sites that the average Stumbler generally would not visit, so don’t forget to bookmark this list, Stumble it, and pass it along to your friends! I hope you enjoy the list, and if you have any additions, don’t forget to comment! Business Plan Primer: A tutorial about business plans. Business Plans: Yahoo Small Business Resources provides guidelines on developing business plans and marketing plans, and offers samples of each. Start-Up Checklist: A business plan checklist to guide you through the creation process. VFinance.Com: Information on Venture Capital, also a free business template. BusinessLaw.Gov: Information on business law for small businesses. IRS Small Business: Information on IRS laws for small businesses and information on starting a business. Law & Legal Aid Resources: Resinets.com information on law and legal aids. National Right to Work Legal Defense Foundation, Inc.
Business Owners Toolkit: A good general discussion on employee issues can be found here. Department of Labor Elaws Advisors: Interactive tools that provide information about Federal employment laws. Department of Labor Small Business Resource Center: Information on Web page designed to assist small businesses in complying with rules, regulations and laws enforced by the U.S. Department of Labor. Society for Human Resource Management (SHRM): Information on Human Resources topics. U.S. Department of Labor: Information on current federal employment statutes. Depending on the needs of your small business, acquiring funding can be a painful process. The following resources will assist you in sorting through the necessities of funding your business. Business Finance: Information on business funding resources and has a database of over 4,000 sources of business capital. Finance a Business (SBA): Information on several SBA financing programs. Garage Technology Ventures: Information on venture capital for emerging technology companies. Startup Journal: Information on deducting home office expenses on your income tax. Startup Venture Toolbox: The Toolbox is organized in the order that most entrepreneurs follow in taking their ventures from idea to IPO. The Money Tree Survey: The definitive source of information on emerging companies that receive financing and the venture capital firms that provide it. Turbo Tax: A link to one of the most widely used tax preparation software packages for homes and small businesses, produced by Quicken. About.com’s Entrepreneur Link: Information from an on line resource pool for small business owners. Center for Veterans Enterprise: Information for Veterans and business. Entrepreneur.com: Information on a number of useful forms you can use in your business. Kauffman Foundation: A search engine specifically targeted at entrepreneurs like you. Finding Distributors: Entrepreneur.com article on distribution and marketing. Getting out of your business: Entrepreneurs Toolkit article on how to get out of your business if/when you wish to exit. Home Business: Information on Home Business, including both opportunities and challenges. Idea Cafe: Information on the basics of getting your idea off the ground, from e-commerce design to logo-embroidered apparel. Jim Blassingame, Small Business Advocate: Information on small business, both opportunities and challenges. National Association for the Self-Employed (NASE): Information for small businesses and the self-employed. Has discount programs and general information. SBC Business Solutions: Communications services products for business users. Small Business Administration (SBA): Home page for the US Small Business Administration site, which contains a range of useful links, tips, courses and advice. Small Business Development Centers: General coaching (from SBDC and SCORE) as well as advice on funding options. Start-Up EPA: Creating a Business Plan: Guidelines on how to create a business plan, why you need one, and what it can do for you. Start-Up Journal: Published by the Wall Street Journal – information of interest to those starting a business. Welcome Business USA: Information on business checklists to help you make sure you are not missing important steps in starting and running your business. Has wealth of resources, how-to articles for business. Yahoo! Small Business – Start-Up Basics: Current info on hot start-up areas and more. The following databases offer free components to assist you with a variety of research needs. Please note that some sites may require registration and are in no way associated with the Disney Entrepreneur Center. http://www.melissadata.com/lookups/: A great free resource offering database search capabilities for demographics and statistics. Highly recommended. http://www.quirks.com/: Resources to help small businesses complete market research projects. AAAAgencySearch.com is a database of members of the American Association of Advertising Agencies. Search the database by agency name, brand or client name, by billings, number of employees, industry experience and category specialties (e.g. African American market, or Business-to-Business marketing. The search engine returns a list of matching agencies and provides the above information for each agency. Advertising Age publishes the full-text of recent top stories from it’s print publication. It has an Interactive Daily, which contains articles about web marketing and critiques of web marketers. It contains rankings of global marketers. Marketing and web marketing conference and event calendars are posted. Advertising World is a service that links to marketing web sites. Come here for directories of agents, associations, market research firms, and PR firms. Find sites dealing with consumer psychology, coupons, web marketing and more. Adweek provides free article excerpts as well as the full-text of one feature story from each of its three major print publications: Adweek, Brandweek, and Mediaweek. The site also posts daily internet marketing newswires and spotlights various brand marketing campaigns. Agency ComPile is a database of advertising, public relations, direct marketing, design, sales promotion, interactive, yellow pages, recruitment, and media buying agencies. It provides profiles at the agency level which include a brief overview, client lists, and specialties. Searchable by a variety of criteria. Dentsu Online Gateway provides data on Japanese advertising expenditures. Click on Dentsu Data to retrieve data. GreenBook is a directory of marketing research companies and services. It features a comprehensive (over 1400 listings) searchable directory of marketing research firms and focus group facilities. Visitors can search for companies by research services (400+ service categories), location, name, or a combination of the above. MarketScope provides historical quarterly newspaper advertising expenditures and ad volume. It also provides readership information, average newspaper prices, and circulation data. Marketing Resource Center is a site that focuses on marketing and the internet. STAT-USA is the Internet source for business and economic information produced by the Federal Government. STAT-USA gathers information from over 50 Federal agencies and distributes from a central source. STAT-USA includes U.S. economic data & release calendars, exchange rates, industrial data, and consumer credit reports. Its international side includes trade opportunity leads, international industry reports, market analysis, imports, exports, and guides for U.S. companies doing business in different countries. Annual Report Gallery lists Annual Reports published on the internet. The database currently links to the reports of over 2000 companies, including most of the Fortune 500. Also includes links to services that compile international Annual Reports. Annual Report Service will mail (postal mail) copies of annual reports of a large group of companeis free of charge. Carol is service which provides financial statements and excerpts from annual reports for major European companies. In some cases, Carol links users directly to corporate home pages. Files may be saved as html. GuideStar provides financial data on non-profit organizations in the U.S. The database contains information on 850,000 IRS-recognized non-profit organizations. Search by organization name or use an advanced search to identify non-profits in certain geographic locations and categories, and of certain types and sizes. Multex Investor provides company snapshots, free real-time stock (and major U.S. index) quotes, price charts, and articles from PRN and BW newswire services. It also provides user with stockscreening tools and industry, sector, and company rankings (biggest movers) on over 10,000 equities trading on the NYSE, Nasdaq, AMEX, and OTC Bulletin Board. Detailed financials & ratios are available. Contains First Call earnings estimates and surprises. PRARS provides a free mailing service. Hard copies of including annual reports, prospectuses or 10k’s on over 3,600 public companies will be mailed by this service without charge to the investing public. Includes “Security Traders Handbook” designed to give investors the information needed to make intelligent financial decisions. Ranks common stocks by popularity. SEDAR WEB SITE provides annual reports for Canadian companies in English & French. Most reports are in .pdf format, although some are in Microsoft Word or Word Perfect. Bank Rate Monitor provides current average rates on: loans, mortgages, and savings deposits, as well as the discount rate, prime rate, and some treasury rates. Also contains a loan payment calculator. Banking studies small business lending in the U.S. The Office of Advocacy annually analyses call report data collected by the Federal Reserve on the lending activity of about 9,000 individually reporting commercial banks. Banks are ranked based on their small business lending on a state-by-state basis. FRED provides historical U.S. economic and financial data, including daily and monthly U.S. interest rates, T-bill rates, monetary and business indicators, historical exchange rates for over 30 currencies, and regional economic data for Arkansas, Illinois, Indiana, Kentucky, Mississippi, Missouri and Tennessee. Also includes online publications: U.S. Financial Data & National Economics Trends. U.S. Federal Deposit Insurance Corporation provides information on the U.S. banking industry, consumer information, and press releases. Includes full text of a variety of FDIC research reports. American Hospital Directory contains information on U.S. hospitals. Search the “Free Services” database by geographic location, name, area code, etc. for a list of hospitals that meet your criteria. Information on hospitals includes type of ownership, number of beds (total and by service), financial data, utilization statistics, and charges for specific services. Europages-European Business Directory Contains contact information on Western and Eastern European companies. Search by company name or product/service. Hoover’s Online provides profiles for over 10,000 companies. Search company by name, ticker symbol, keyword search, or industry. Full Access is subscription based. More limited company reports are available for free. JobWeb: Employer Profiles is published by The National Association of Colleges and Employers which describes various employers and provide links to their home pages. Thomas Register allows users to search by product name for U.S. public and private manufacturers. Includes over 60,000 product heading categories and over 5500 on-line supply catalogs. Vault Reports provides 2-3 page employer snapshots for 1000 U.S. companies. Reports are sent to users via e-mail. Free information is also available in a career advice column and a diversity forum. 50-70 page reports on employers are available for a fee. Information in these reports is provided by current and former employees, and covers areas such as corporate culture, salaries, career ladders, the recruiting process, and more. Free previews to these reports are available. Websense Company Locator provides a Company Site Locator which allows users to find private and public companies’ websites worldwide. When using search engine, type a complete, partial, or specific domain name under Company Name. WetFeet Press provides free online profiles of major consulting and finance companies. Profiles created by the companies themselves include recruiting, company, career, and corporate culture information. More in depth reports, with anecdotes and comments from insiders, are available for a fee; for companies in the finance, consulting, high tech, and brand management industries. A Business Researcher’s Interests is a searchable knowledge map of Contemporary Business, Management and Information Technology issues. It provides access to hundreds of full-text papers, magazines & journals, case studies and tools, and thousands of online resources on some of the current issues of interest to Business, Technology & Information professionals. The web site of the Conference Board provides a searchable database of management and economic research and forecasts. The catalog to Harvard Business School’s case studies is now available online. Search by company name or management concept to find appropriate cases. Catalog access is free; cases cost an average of $5 each. Ordering can be done online. Bureau of Labor Statistics provides data and information on consumer and producer prices, employment and unemployment, occupational compensation, workplace injuries and illness, employee benefits, and productivity. FedStats provides statistical data generated by many different U.S. Government agencies. Statistics on interest rates, inflation rates, and wages are available as are those on breastfeeding, education, consumer credit, and many more. Key agencies included are BEA, BLS, Bureau of Justice Statistics, Bureau of Transportation, Bureau of the Census, EIA, OMB, and more. Governments on the WWW is a meta site linking to official government web sites for over 200 countries. Many of the sites it links to are in local languages. IMF Staff Country Reports in Full-Text are statistical reports covering IMF member countries. Coverage is 1997 – present. Data is extensive in fiscal and economic areas and textual analysis of country economic developments is sometimes available. The IMF main site also provides access to quarterly and weekly reports, as well as working papers, on the IMF’s efforts and the status of the global economy. Infonation is a statistical service provided by the UN. Includes about 50 demographic, economic, and social indicators for member nations. Does not include time series data, but rather the most recent data published by the UN. NAA.org, the web site of the Newspaper Association of America, provides historical quarterly newspaper advertising expenditures and ad volume. It also provides readership information, average newspaper prices, and circulation data. Click a category for links to data in that category. The Securities Industry Association (SIA), established in 1972, brings together more that 600 securities firms to accomplish common goals. Their website includes several of the association’s publications, including securities industry trends, statistics, financial results and free newsletters. This website also includes SIA’s job bank and career resource center. Statistics Canada includes recent economic statistics, data highlights of news releases, and census data. Statistics Canada is mandated under the Statistics Act to produce and publish statistical information on the economic, social, and general conditions of Canada and its population. Available in English and French. Statistics Norway contains press releases, monthly statistics on external trade, the index of production, and CPI monthly (1930-present). STAT-USA is the Internet source for business and economic information produced by the Federal Government. STAT-USA gathers information from over 50 Federal agencies and distributes from a central source. STAT-USA includes U.S. economic data & release calendars, exchange rates, industrial data, and consumer credit reports. Its international side includes trade opportunity leads, international industry, market analysis, imports, exports, and guides for U.S. companies doing business in different countries. UN Statistics Division provides a variety of types of demographic data for all of the countries in the U.N. Some parts of the site are fee-based, but several are free. United Nations has news, publications information resources, and documents. It offers information on peace and security, economic and social development, international law, human rights, and humanitarian affairs worldwide. World Bank includes a compendium of socioeconomic and environmental data. It contains press releases, speeches, and media contacts on various topics ranging from HIV/AIDS to business products and services. ATT 800# Look up toll-free numbers anywhere in the U.S. Search by category, state, city, business name–or any combination–to get to the listings you need. Updated twice each month. Reverse phone number search available. InfoSpace allows you to search for people, businesses, e-mail, government offices, fax numbers, toll-free, reverse lookup, and more. Super Pages is a directory of businesses. Contains links to web sites, where applicable and links to street maps of areas surrounding businesses. Search by company name or business category. Super Pages also contains listings for 100 million U.S. residences. It also contains a Canadian yellow page directory. Switchboard is a free nationwide residential and business directory. Look up people by last name, first name, city, state, or any combination of these. It provides addresses and telephone numbers of individuals listed. Infobel World provides links to online telephone, fax, and business directories from around the world. Yahoo People Search! is an online directory which allows users to search for people and companies via White Pages, Yellow Pages, and an AT&T Toll Free listing. Users can also perform advanced E-mail searches here. Maps/Directions available. Access to U.S. Demographic Data provides links to a variety of demographic analysis tools. American Demographics publishes its print edition on the web in full-text access. Users are asked to browse the site and to subscribe to the print edition if they want to continue using it. Also contains access to Marketing Tools articles, recent demographic reports, and a bookstore of American Demographics’ publications. Asian Demographics provides socio-economic data for 14 Asian countries. Most data is for paid subscribers, however summary data is available under the Country data section. It also contains information on the population, consumer expenditures, education, labor, GDP, tourism, transportation, and communications data of Asian countries. FedStats provides statistical data generated by many different U.S. Government agencies. Statistics on interest rates, inflation rates, and wages are available as are those on breastfeeding, education, and consumer credit. Key agencies included are BEA, BLS, Bureau of Justice Statistics, Bureau of Transportation, Bureau of the Census, EIA, OMB, and more. Penn World Tables provides data on all countries on a variety of government finance, consumption/production, and investment indicators. Data is annual in most cases. Penn World Tables are provided by Computing for the Humanities and Social Sciences (CHASS) at the University of Toronto. Statistics Norway contains press releases, monthly statistics on external trade, the index of production, and CPI monthly (1930-present). Also includes a variety of demographic data. Pages are available in Norwegian and English. UN Statistics Division provides a variety of types of demographic data for all of the countries in the U.N. Some parts of the site are free-based, but several are free. U.S. Census Bureau: Official Statistics is the most authoritative site for economic and demographic data on the population of the United States. Business 2.0 is a magazine that examines the changing landscape for commerce in the digital world. It puts its magazine on its web site in full-text format and supplements content with articles from other sources. The in-depth “case” studies of internet and high-tech businesses are particularly valuable tools for entrepreneurs. Catherwood Library Guide to E-Commerce is a guide that provides links to e-commerce resources on international commerce, technology, and legal issues. It also links to online journals and newspapers, industry and association guides, and government policy pages. It is maintained by Cornell’s own Catherwood Library in the School of Industrial and Labor Relations. E-Commerce Times publishes current news for the internet industry. Known for its regular industry news updates (every 15 minutes). e-lab: The Electronics Commerce Research Laboratory is a corporate-sponsored research center at Vanderbilt University devoted to the study of strategic, consumer behavior, and policy issues related to electronic commerce. Recent report topics include the digital divide, online advertising pricing models, and consumer contro in the online environment. E-lab publishes its research findings full text on this site. ebusinessforum.com is the EIU’s center for information on E-commerce worldwide. It provides news and reports on the state of e-commerce in many countries as well as best practices reports and “thought leadership” articles, which provide analysis of the industry. Epaynews – ePayment Resource Center publishes articles, white papers, and statistics on the electronic payment industry, which has been spurred by the growth in e-commerce. Nua Internet Surveys provide articles on the demographics of internet use. Click on a category (e.g. seniors, teens) in the left margin to find information on the trends in that group’s internet usage patterns. Users can also search the archives for articles on a specific topic about internet use. America’s Business Funding Directory provides information about methods of seeking different forms of capital in order to operate a business. It also provides lenders/investors with information on how they could get in contact with those who are seeking money. In addition, it contains a library resource on foreign trade, government information, business education, etc. Entrepreneur Magazine provides an online site featuring many articles from the print magazine as well as other resources for entrepreneurs. Users can searched archived full-text articles from 1991 – present using keywords. . The site ranks the hottest 100 new businesses, 100 best banks for small business, and best cities for small business. It provides entrepreneurship tips, and features a Franchise Opportunity guide, which includes 500 franchises & rankings of the best new, fastest growth, and low investment franchises). The site also discusses trends in entrepreneurship, , and provides EASI geographic economic reports. 75 entrepreneurs (now millionairs) tell their stories at this site. A library of free business forms is also available. It also contains information on legal help such as, assistance with searching for lawyers, help with documents, previous court cases, etc. Membership is FREE. Smart Online provides free online software for creating business plans, marketing plans, etc. Users can also download HR documents, accounting forms, and a variety of legal forms. Registration is required, but is free. Industry Research Desk contains an index of links to industry home pages. Content of the pages vary, but may include the following: descriptions of industry trends, industry-related articles, rankings, statistics, and directories of buyers, sellers, and industry members. Industry information: industrial and service center resources from ITA. is a U.S. International Trade Administration site which provides descriptions of and statistics on U.S. and international industries. It encompasses a broad range of industries that include basic industries, consumer goods, environmental technologies, service industries and finance, tourism, technology and aerospace industries, and textiles and apparel. Thomas Register is a directory of manufacturers. Users can search by product type for a list of manufacturers in the industry (includes brief descriptions). Users may also search by company or brand name. The Gallup Organization freely provides much of their polling results online. Includes public opinion on social issues, business, politics, and technology. Contains survey results on respondent’s health habits, recreation and leisure time, and attendance at arts and cultural events. J.D. Power and Associates provides free access to part of its market research online. Contains annual award reports for the automotive, telecommunications, credit card, and travel industries, and provides access to a searchable database of statistical and descriptive excerpts from its annual studies. Survey of Consumer Finances (SCF) is a triennial survey of the balance sheet, pension, income, and other demographic characteristics of U.S. families. The survey also gathers information on the use of financial institutions. The links to the surveys provide summary results of the surveys, codebooks and related documentation, and the publicly available data. American Demographics publishes it’s print edition on the web in full-text access. Users are asked to browse the site and to subscribe to the print edition if they want to continue using it. Also contains access to Marketing Tools articles, recent demographic reports, and a bookstore of American Demographics’ publications. Business Week gives you the current issue of Business Week including stories that only appear in Business Week International editions. CIO On-Line is a website for senior level IT and business professionals. It provides in-depth articles and research reports on IT issues, including year 2000, web-related issues, electronic commerce, data warehousing, outsourcing, etc. It includes the full-text of CIO’s articles from 1994 to the present. The Economist web site offers many full text articles from the current issue and selected articles from recent issues. Registered users (registration is free) may search the site’s index of archived articles. The site posts Emerging Markets Indicators, Economic Indicators, and Financial Indicators on a weekly basis. Users can have the Business & Politics This Week summaries sent to them via E-mail. Elsevier’s Econbase is a searchable database of articles from many of Elsevier’s publications, including the Journal of Financial Economics, Journal of Financial Markets, European Economic Review, and about 35 others. Select full-text is available to the Cornell Community only. Entrepreneur Magazine provides an online site featuring many articles from the print magazine as well as other resources for entrepreneurs. Users can searched archived full-text articles from 1991 – present using keywords. The site ranks the hottest 100 new businesses, 100 best banks for small business, and best cities for small business. It provides entrepreneurship tips, and features a Franchise Opportunity guide, which includes 500 franchises & rankings of the best new, fastest growth, and low investment franchises). The site also discusses trends in entrepreneurship, and provides EASI geographic economic reports. 75 entrepreneurs (now millionairs) tell their stories at this site. A library of free business forms is also available. Euromoney provides full-text articles from recent issues of Euromoney, Euroweek, Corporate Finance, Global Investor, Project & Trade Finance Newsletter. It also contains a data section which contains bondware tables, country risk surveys, and emerging markets bank ratings. Search for articles by keyword or category. Access to some parts of the site is restricted to registered users; registration is free. Far Eastern Economic Review includes significant portions of the journal online in full-text format. It also provides a searchable archive of past issues. FT.com provides the full-text of about 1/3 of the current day’s issue of Financial Times. It contains a searchable archive of 30 days. It also provides exchange rates, share prices, equity index prices, company briefings, and leading economic indicator data for several countries. Free registration is required. Forbes covers the current issue plus older ones in their archives. Also includes the 500 Largest Private Companies and The 200 Best Small Companies in America. Fortune covers the current issue plus older ones in their archives. Also includes the Fortune 500 List, Gloabl 500 List, Pacific Rim Special, and Investor’s Guide 1997. Globe & Mail provides users with various topics of information including news, sports, classifieds, mutual funds, advertising information, births and deaths, etc. It also includes daily closing markets data. Allows users to generate stock reports, produce charts, search for articles, learn about mutual funds, and how to set up a fundlist. Harvard Business Review provides free abstracts and ordering information for recent articles. INC Online is a journal which contains articles on-line. It covers areas including advertising, marketing, products, and consulting. It also includes The INC 500 which provides users with information on American’s fastest-growing private companies. It contains the latest news, product announcements, employment opportunities, and more. International Business & Technology is a meta-index that links to U.S. and international e-journals & newspapers, T.V. and radio sites, technology-related sites, banks, currency sites, and market information. Investor’s Business Daily covers business, financial, economic, and national news. Kiplinger Online provides users with information on business forecast, personal finance, stock quotes, top funds, yields and rates, and retirement advice. It also includes information on savings and investing, fund-raisings, and allowances for kids. New York Times on the Web provides subscribers with the latest news online. News is broken down into various categories including International, Metro, Sciences, Business, etc. Includes weather forecasts, up-to-minute sports scores and summaries, and market quotes for stocks, options, and mutual funds. Red Herring provides business information for the technology and entertainment industries. USA Today provides general news as well as Wall Street market summaries, global market news, mutual fund reports, economic reports, bank rates, and IPO’s. Washington Post provides feature articles from its print edition, as well as additional online features. I haven’t talked too much about financials, and I don’t really plan on doing so today. I would, however, like to wet your taste buds with some tips on forecasting. Remember, forecasting is in all reality BS. Projections can only take you so far but they do help you when setting goals for your small business. You are better off selling yourself short than throwing out unrealistic numbers. Be factual and conservative with your estimates. You arent going to go from making $10,000 to $10 million. It just isnt going to happen unless something truly astonishing happens in your business or your market. Quantify your projections and dont just pull them out of a hat. Make clear and concise assumptions. Back those assumptions up with a written list of your reasoning. Pro forma financials will take your far. Utilize industry specific data and not just general data such as census publications. Contact your local or university library for assistance in tracking down this type of information. For those of you in school or who are stupid rich – try IbisWorld. This goes back to the above statements, but it’s important. Your projections are going to be suspect if your sales or profit margins are higher (or lower) than the industry average. As you progress, compare your forecasts to actual results and determine what went wrong (or right!). Yes, this was a bit “schoolish” but you are Startup Students! Class dismissed. This is a quick tip I picked up in class recently, and I thought I’d share it with you. It’s similar to other strategies I’ve discussed for different aspects of your small business, but in this case we’re applying the techniques to your target customer. It’s pretty simple and even somewhat enjoyable. By profiling your customers, things inevitably become easier. You’ll even discover a few “invisible” customers you didn’t even know were lurking. The technique I’d like to share with you involves building a target market collage. Look through old general interest magazines, industry publications, and those you think your target audience would read. Cut out twenty of so pictures, phrases, and quotes that seem to represent your target customer. Come up with a list of your target customer’s favorites. Include TV shows, movies, dining options, hobbies, mucic, books, URL’s, etc. Sounds kinda corny but it helps you to start thinking “outside the box” – opening your eyes to alternative thoughts about your target. It’s also good to stimulate the “other” side of your brain for a variety of reasons. Again, quick post today but I just thought some of you might be interested in giving this a shot. Class dismissed. Good morning Startup Students. While we have not yet explored the core aspects of a bullet proof business plan, I’d like to take today to discuss with you the benefits of your promotional plan. Without marketing and promotion, the idea, management, and financials of a business plan won’t take you anywhere. Here’s a quick list of 5 easy steps to rock solid promotional plan. You must first determine your sales and marketing objectives. Utilizing a matrix is ideal for this type of analysis. I discussed using a matrix analysis to select your opportunity, but the underlying techniques still apply. Develop strategies to achieve your goals. Brainstorming and mind mapping are ideal solutions for coming up with these goals. Create a well defined method for carrying out your strategies. Use your best judgment for now, but we’ll explore this a bit more at a later date. Determine a budget and then enact a program to assure the success of your promotion. Continuously evaluate the results of your promotional objectives and adjust your strategy as needed. If you have any additional suggestions you’d like to share, please comment! That’s all for today students, see you tomorrow. With an entire web of information out there, it’s tough to sift through and find the things you need to really get your business off the ground. We’ve talked extensively about ways to hone your idea and gather valuable data to ensure your opportunity’s success. Today it’s time to put those ideas into motion with some top notch FREE resources to take your business from idea to fruition. University of Central Florida’s Venture Lab: You might call this a plug for the school I attend, but these guys have got some really incredible information and resources available to everyone. My favorite aspect of this site is the vast amount of free templates for the creation of your business plan. From market research tools, to financial pro formas, term sheets, employee documents, and of course business plans. This place is an absolute treasure trove of information for the development of your next great startup! Google, that’s right Google. But not just the typical search interface – we all know how useful that is. I’m referring to the University Search. Many major Universities offer Entrepreneurial programs and degrees these days, and the resources these colleges offer online is astounding. I recommend starting out with the University of Colorado which is one of the premier Entrepreneurial programs in America. Already got your business off the ground? I just came across this site yesterday from my friends over at Mind Petals and I’ve already put it to good use by sending out invoices worth over $2,000. Blinksale offers a free subscription if you send less than 3 invoices per month, which is perfect when you are just getting your feet under you. The Small Business Administration is terrific as well. Most of you are probably familiar with these guys. They specialize in guaranteeing small business loans. In addition to this valuable service, they offer tons of great information such as templates, sample plans, and other startup assistance. Blogs. And lots of them. There are an astounding number of bloggers these days, and many are out there to help young entrepreneurs. Start with a search of the Mind Petals blogger network and start exploring some of their blogrolls. Be careful though, you might spend all day doing this one! There are a ton more, but since I post every day I will save the rest for next week’s Field Trip Friday – so if you havent done so already, subscribe to the RSS feed and stay tuned! And now startup students, it’s time for show and tell. First up comes from my brother Blaine. He put together a custom entertainment center for our 52” HDTV. It really turned out pretty awesome. I’d also like to take a second and introduce you to a buddy of mine’s blog. He’s definitely got the entrepreneurial spirit and works at New York based startup Confabb: The Conference Community so be sure to check it out. See you on Monday students, have a great weekend! Good morning Startup Students! Today we’ll be discussing ways to gather intelligence on your competitors. This can be useful in a variety of ways such as identifying cutomer habits, picking up on competitor workflow processes, and so on. With such fierce competition in todays market along with ever changing consumer opinions, it’s imperative that you stay one step ahead of your competition. Quickly, here are some things to think about when checking out your competition. Be sure to broadly define your competition at the start, and carefully move inwards through the industry to determine all competitors. There are tons of great resources out there, so use them! Internet, public filings, local libraries, etc. That’s all for today, if you have any questions or comments, don’t forget to post them. Class dismissed. Quick post today because I’m feeling a bit under the weather. Identifying the buyers in your target market is critical to the success of your new business. Today’s Top 10 focuses on the questions you need to answer about the customers in your target market. What types of customers are you trying to attract? What are their habits and demographics? What problems are your customers facing with their current solution? What needs of their’s are not being met? Which segments of your market are being ignored, and how can you capitalize on them? Who are the traditional customers in this market? How can you expand your reach into secondary markets? Again, how is the market further segmented? What motivates their buying decisions? Needs, resources, etc. Can you identify the channels of distribution being used? See if you can find which channels are being ignored and figure out how to capitalize on them. In what ways are customers dissatisfied with the current offerings in the marketplace? Again, how can you capitalize on this? Not a question but a call to action. Get out there and talk to your potential customers! Use the techniques we’ve discussed in previous posts and just make it happen. Again, sorry for the quick post – but I’m really not up to par today. And folks, I know you are out there, so how about starting to leave some comments! Class dismissed. Good morning startup students! Today we are going to discuss how to define your target market. You’ll find some overlap from my post on Friday about Marketing Intelligence, but it just goes to show how important these things are for young entrepreneurs. You really want to identify the market niche you intend to serve. It’s always better to be too specific at this point, you can broaden your target in the future. Take a look at what benefits you bring to the table. What problems are you solving for your customers and the market in general? What specific needs to you fulfill? When looking at the benefits you bring to the table, keep in mind there are two generally accepted types of benefits. You convey hope, you massage fear, you instill love, or merely provide convenience. You assure increased profits, offer lowend pricing, save customers money, or offer extended payback periods. Remember, the above are just examples and aren’t meant to be the only benefits. Once you’ve defined your niche, you need to get out there and talk to your customers, similar to what I talked about Friday. They key point here is to just LISTEN and identify their needs. That’s all for now, enjoy the rest of your day and I’ll see everyone tomorrow. Class dismissed. Sorry for not posting yesterday, I had a test along with a presentation of my business plan (which I’ll be sharing with you eventually). At any rate, today is the start of a new segment entitled Field Trip Friday. I had the opportunity to take part in a secret shopping of Universal Studios Florida. It was a great experience, and I learned some good pointers for completing primary research. Primary research is a vital tool for today’s young entrepreneur as often times you’ll find the data you need simply isn’t accessible. Let’s look at a quick example. Say for instance you are interested in opening a fast service restaurant catering to the after hours crowd. You’ve developed the idea, know what you want to serve, and even have a location in mind. But without actually going downtown at 2am, how are you going to know if your target market is interested? You need to interview the individuals leaving the clubs and get a feel for whether or not your idea meshes with their specific needs. I’ve outlined a few pointers below that I picked up today, and I think you’ll find them useful in the future. These can be applied to all types of primary research including interviews, surveys, observations (like secret shopping), and analysis. Determine what you want to know and how you are going to get that information. Identify your target market and approach them. Have a questionnaire in mind, with follow up questions based on the answers provided. Be honest about your reason for conducting this research. Exude the passion you have for your idea, and your interviewees will pick up on this leading to more positive responses. Be aware of any biases you might have going into the assesment and try not to let them play a role in receiving the information. And since this is the first installation of Field Trip Friday’s, I’ve got a special treat for you – Show and Tell! I’d like to introduce to you my new pet turtle, Larry David. He’s very small and still pretty nervous about his new home. In fact, he hasn’t been eating very much and I’m a bit worried. If any of you startup students have some pointers, please pass them along! If any of you would like to showcase one of your “field trips” or participate in Show and Tell in the future, please let me know! Class dismissed.